There are plenty of transportation companies already competing hard in a given market. So, your new transportation company stands a chance only if it offers unique and high-quality services. Besides that, in the initial stage, your new company’s name matters in catching the attention of clients and customers. Unique, simple, and catchy names even go a long way in establishing a business in its niche. Transportation business is booming on the back of ever-increasing demand for carrying goods to distant places in a cost-effective way. In the U.S, the trucking sector alone generated $66.5 billion of revenue in March 2018. The opportunities in a trucking business are plenty. Your company can provide commercial services, transportation of livestock, it can be a heavy hauling company, or a vehicle transport company, and many more. While the transportation demand is on the rise, it does not automatically convert your trucking company into a profit-generating business. There is still a lot of thinking and planning to do to get a new transportation company noticed. Many initial steps are needed to be taken to impress potential clients. Naming a transportation company is the first step you take before thinking everything else for launching the business. But naming a trucking business, like others, is a process. Rarely, a business gets named in a flash. Some businesses named after an owner are comparatively easier to name as there is nothing much to think about. Otherwise, naming is a creative process that takes its own course and time to complete. Do not take your company’s name lightly as it has the potential to make and break your business. Here is a list of transportation company name ideas for your startup. First, you must be clear about the purpose of your trucking business. When talking about the purpose, it involves some key things. Make sure that you have a working plan. Set your business goals and identify them precisely. For example, be clear about the type of goods your company will transport. You cannot ignore this fact. Once you know your business and its purpose well, this will be reflected in your company name as well as in your transportation company logo. Looking for a transportation logo design? Every business has a specific set of people as ideal customers. By targeting them, a business can focus its resources to make specific marketing plans. You will be saving your time, energy and money by targeting only those customers who matter. So, pick a name that expresses the aspirations of the customers you need to target. Remember that your business logo design will also be targeting those customers to drive their attention to your new company. So, the business name and your logo both addressing your customers’ are desirable to make a lasting impression on the audience. A simple name is pronounced easily by everyone. When people can spell out the name quickly, they can recall your business. But simplicity does not mean that any casual name can do justice to your business. Instead, it should also be a unique and creative name. Also, avoid any hard-to-spell names. Here are some examples of simple names of big transportation companies. You will notice that each name tells us the purpose of the business and what good it transports. Here are the names of some popular trucking companies – FedEx Freight, United Parcel Service, FedEx Ground, Swift Transportation Co., FFE Transportation Services, Overnite Transportation Schneider National,Roadway Express, Inc.,Yellow Transportation Inc., Allied Systems, Ltd,Estes Express Lines, B. Hunt Transport, Inc., United Van Lines, Inc., and ABF Freight System, Inc. These all are simple names, and no fancy words or flowery language has been used. With such names, your professional graphic designer can design a memorable logo, which is your trademark as well. While you look for a unique name, do not hesitate in using some typical transportation words. These are ideal words to give a quick hint of what your business does. For example, the words such as “carriers”,“hauling”,“logistics”, “freight”,“transport”, and “trucking” tell the clients about what your business does without visiting your office. These are the commonly associated words with a transportation industry. People and clients, therefore, know about your company’s specific business. Similarly, use the common words related to tour and travel if your transportation company operates in this sector. Also, with these words, tour and travel logos will be effective visuals for target audience due to the specific words and impressive colors etc. elements. Ask your friends and company members to sit together and talk about the company name you should have. Such brainstorming is useful in generating some interesting naming ideas. You have many ideas coming from different people. You should get the team to sit for several sessions. This is a way to come up with some names that you can shortlist for further discussion. However, before starting the session, give the members a guideline regarding the choice of words. It should let the members know about the words that you just do not want to be included in the company name. You may simply tell that such words do not look good in your travel logo. So, come out with some guidelines so that the members know what to what to think and what to leave out. A name generator software helps entrepreneurs to generate names for their transportation companies. When you type a keyword related to your transportation niche, you have a long list of potential company names in your sectors. But do not blindly consider these names. Treat them as ideas only. It is possible that the name you like would have already taken with some twists and turns. But you can surely have an idea of the names from the name generator. For more ideas, use different keywords in the search box. Just play with the words and see if the result can give you some more ideas. The importance of a unique name idea will be felt more when you will hire graphic design services of a professional to create great designs like logos and brochures. With a unique name, the designs look even more impressive. A business name available as a domain name is also essential for doing business online. You will be putting your transportation company’s services online by creating a website for the business. This means that your domain name, which is your address of the business on the web, is as crucial as is your business name. Once you have shortlisted some names, check them if they are available as .com, which is the most sought-after domain name system. If your business name is not available as .com, still see if you can buy if from the owner. Many people buy .com names as an investment and sell at higher prices to the needy ones like you. So, find out if the domain name is available from purchasing from the owner. If not, then try other variants like .net and others. So, when selecting a name, do not just think how it will look on your travel company logo but also if it will be available as a domain or not. To check the availability, visit sites like GoDaddy, and Network Solutions. Since you will promote your transportation business on social media, you need to ensure that the name is available as a social handle. To promote your new business, think of creating an effective social media page design that entices people to inquire about your services. But, first, make sure that the desired social media handle is available across all the major social channels like Facebook, Twitter, Pinterest, and Instagram. Once you have pinpointed a name for your transportation business, its availability as a trademark is also equally important. It may be that the desired name has already been registered as a trademark name and logo. In case you are using the name, you may invite some legal troubles because of the infringement of the registered name. To check the trademark registration availability, visit USPTO.gov in the U.S or the respective authorities in your country. If the name can be registered as a trademark, then do that quickly before someone else grabs it. Even if you think that the name you picked is the right one, get feedback from whoever matters. Sometimes, a better idea emerges from unexpected quarters. So, ask your friends, neighbors, and followers on social media to suggest a name or comment on a few names. For example, when thinking of graphic design ideas, you may conclude that the business name is too lengthy to nicely fit in a design of a logo or business cards. 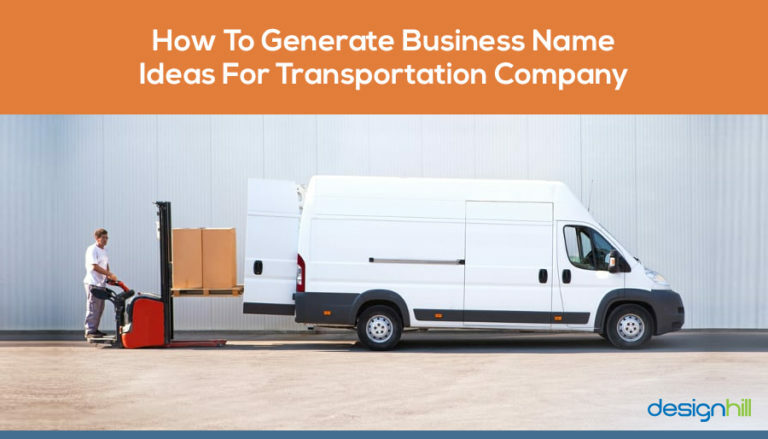 These are the key and fundamental aspects of naming your transportation company. You should also be prepared to invest time as the naming process may take many days. Just keep in mind that a casually selected name may even harm your business prospects. So, have patience and wait for an appropriate name. After you have found a suitable name for your transportation company, the next step will be to create its effective visual identity. That you will do by creating nice visuals such as a logo, websites, business cards, and brochures. These work well for your brand promotion. To get nice visuals for your business promotion at affordable costs, use Designhill, a leading marketplace to create a wide range of designs. Naming a business is a process that requires you to cover its various aspects. When picking a name for your transportation company, make sure that it is unique and conveys your purpose of the business. It also should target your audience. But its availability as domain name and trademark also is equally crucial.